What do you like the most about your sorority? 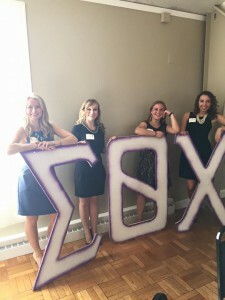 My favorite thing about the Sigma Theta Chi sorority is definitely the diversity within the group, I just love how there is no cookie cutter Sig Thet. I think you can find people from all different backgrounds and all different “stereotypes” in the group, and that just makes me a better person because I’m constantly around people who have differing opinions and like to do different things than me, but at the same time I think that we all have a similar core set of values and we all share the bond of being a Sig Thet and wanting to better the group. What is your fondest memory of being a Sig Thet? My fondest memory was our 70th anniversary that we had this past homecoming weekend. It was so great seeing all the different Sig Thets from the class of 1948 or 1950 and even those who graduated this past year. You could really see the character of a Sig Thet through all those years and I feel as though I would have been friends with all of the former sisters of the sorority regardless of what year they graduated. It’s really cool to see that bond of sisterhood transcend through 70 years. It’s definitely cool to see the diversity of sisters throughout the years and see how we’re all still the same. Do you have a favorite event put on by the sorority? My favorite event is our fall formal – I love getting all dressed up. We all go out for a fancy dinner and we bring dates, it’s a great time. My favorite event that we host on campus is our Big Man on Campus event, where guys from different housing groups and fraternities get to compete in a hilarious pageant. 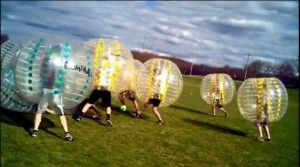 It’s really just a fun event for the whole campus community. I remember rushing and thinking that the event was so cool, and now that I help put it on I see just how much work goes into it and how much money we’re able to raise for the American Cancer Society. It’s fun and rewarding. Is your sorority a part of Relay for Life? Yes. 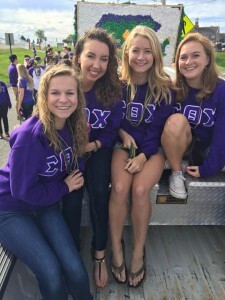 The Sigma Theta Chi sorority and Pan Sophic Fraternity are the organizers of Relay for Life and each year we host different events from November to April. We try to get different groups around campus to form teams and they raise money throughout the year to give to the American Cancer Society and then for a 12 hour period we host a walk/ relay in the IM rooms. Each year we raise approximately $20,000. It’s really cool to see that event take shape and participate in all the planning. Can you tell me a little about your sorority mom, Seniora Ligo? Yes, Seniora Ligo is the best; we are incredibly blessed to have her as our sorority mom. She is very involved with the group and is always inviting us over to eat food or bringing us cookies. I consider her my actual mom. I know that if I was sick she would come take care of me and I know that she would do that for any Sig Thet as she genuinely cares about all of us. Can you speak to the friendships you’ve made as a member of Sigma Theta Chi that you might not have made otherwise? friends through all different walks of life and I’m not sure that I would have made those friendships had it not been for the Sigma Theta Chi sorority. Logan is currently a senior entrepreneurship major at Grove City College. He is currently the president of the college's Innovation Club and the vice president of the Grove City Gun Club. He has a passion for new ideas, creativity, and innovation and specializes in helping others with their ideas. In his free time, he enjoys photography, cooking, and working on small business ventures.